Lamani Lin's interior was totally redesigned to include a saloon-length galley to port and a leather settee to starboard. Originally the saloon contained a small galley to port and forward of that was a chart desk and storage unit and to starboard a small dinette and settee. 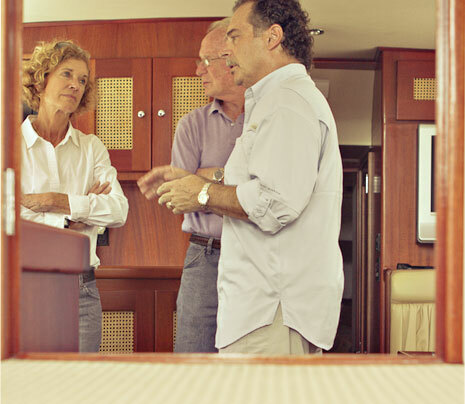 Joe and Linda wanted a more updated, spacious saloon, similar to the one they had seen on another 44' Huckins, Blake Matherly's Wanderer. To complement the yacht's classic elegance, cane-fronted door cabinets were added throughout the interior. Our Huckins team also built new cabinets to match the original woodwork found throughout the boat. Another major part of the renovation opened up a larger space to starboard for the helm station, and moved the companionway off center to port. This made room for the helm station to feature a full electronics display and a double helm seat. Now, six years, later Joe is quite pleased with all the work that has been done. "All your work has held up beautifully, and we're not light users. We've taken this boat back and forth to the Bahamas, up to Hilton Head, South Carolina, on day trips down to Naples, Florida and countless other adventures." 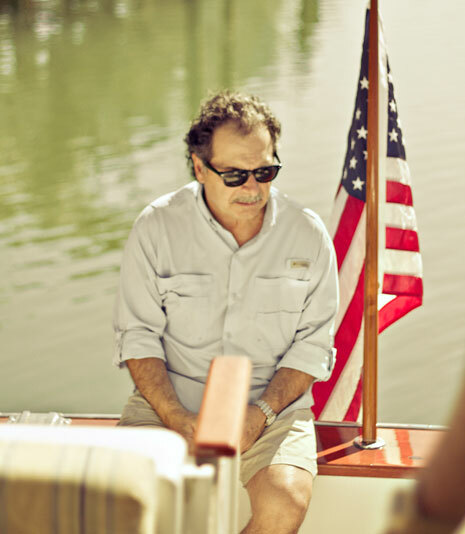 Although Joe is extremely pleased with all of the work we did, he advises that new boat owners spend at least one year on their boat before making any major changes. "I overdid it," he admits. "The washer and dryer weren't necessary. The watermaker wasn't necessary and I would have rather had two refrigerator drawers instead of having the freezer at the bottom. I should have listened to you, Cindy." If you are a new boat owner, we recommend that after purchasing your boat, you spend time cruising on her before investing in any major remodeling. 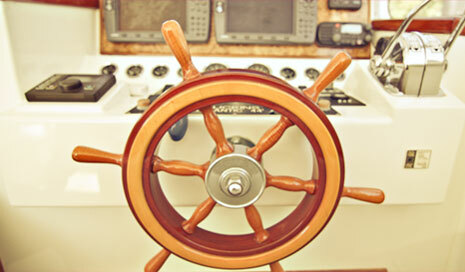 We see more boat owners overload their boats and regret changes they made before knowing exactly what they want. Buddy was also impressed with the boat's condition. "The boat looks fantastic. I'm very pleased with how nice it has been kept. I remember building it with Tom and stepping on this boat again, for me, is like taking a walk down memory lane." Tom Purcell would also have been pleased with the boat's upkeep and we know he is up in heaven looking down on us. He is probably grinning from ear to ear knowing his hard work in making this gorgeous boat is now being shared by a happy family with a penchant for yachting adventures.